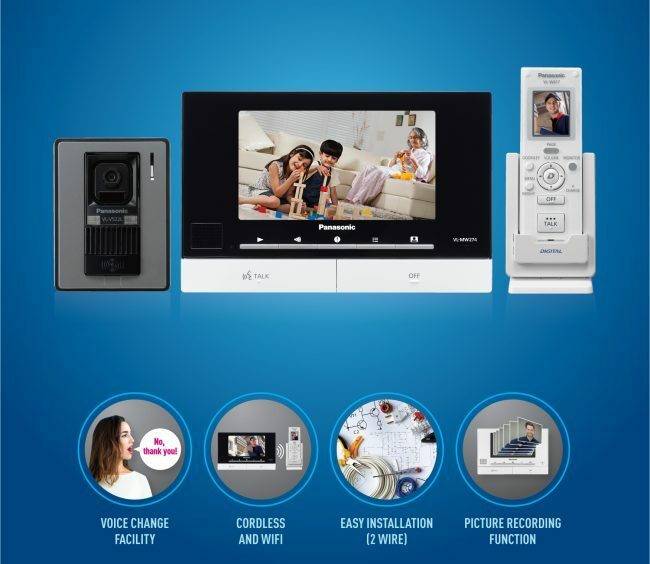 Panasonic today expanded its portfolio of Video Door Phones and launched the VL – SW 274 which is targetted for Single house Apartment and Condominium residential market. Panasonic VL – SW 274 Video Door Phone has features of wireless monitoring, night vision with LED lights, voice change function, picture recording and electric lock release support. This Door Phone is priced INR 33,450. The VL – SW 274 can be connected with up to 6, wired and wireless, monitors. With the assistance of the 2.4 GHZ wireless sub monitors connected across the house, the users can check visitors from the comfort of their own space, eliminating the need to walk to the unit and then checking for the visiting person. Furthermore, its electric lock release feature enables the user to unlock the door from anywhere in the house. The VL – SW 274 comes with a voice change function, which enhances the user’s voice to make it sound similar to that of a grown man. Its additional security features include picture recording, which allows the main monitor and the extension monitors to record images from up to 50 door phone calls. Further, its door station comes embedded with LED lights, which enables a clear cut display of the visitor at a distance of about 50 cm at night. This is certainly useful product for Home. and yes when family matters then quality cannot be compromised so instead of going for cheap Chinese brand I will go for Panasonic Japanese brand.